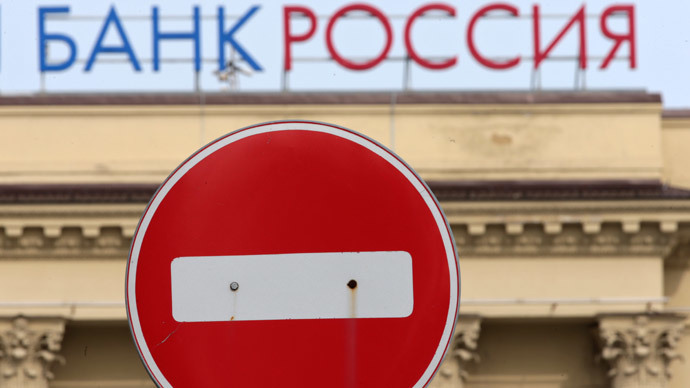 The US has frozen accounts of Russian banks SMP, Rossiya and its subsidiary Sobinbank worth in total $640 million, as part of America’s escalating sanctions war against Russia over its policy in Ukraine. Russian assets have been frozen in dozens of US financial institutions such as Citibank, Goldman Sachs and JP Morgan Chase, says the Wall Street Journal referring to US Treasury data. Since March 2014 Western countries have sanctioned Russian politicians, businessmen and companies over the conflict in Ukraine. On March 4, President Obama prolonged US economic sanctions against Russia for another year, saying the country’s policy over Ukraine poses a threat to US security. Bank Rossiya has confirmed the frozen accounts to RT. It has become hardest hit Russian organization after it fell under US sanctions after Crimea became part of Russia. The frozen accounts of Bank Rossiya in the United States include $572 million which is about 10 percent of its 2013 assets, at today’s exchange rate. In 2013, Bank Rossiya reported total assets of roughly $5.6 billion (338 billion rubles) at today’s exchange rates. The frozen assets include accounts belonging to Sobinbank, a wholly owned subsidiary. The bank had its biggest $435,433,344 asset placed on a single US account with a financial company called Computershare Inc. Some tens of millions of dollars were frozen in the accounts of Raiffeisen Bank, according to the US Treasury. The US explained the freezing of the bank assets on its blacklisted owner Yuri Kovalchuk who is part of the Kremlin inner circle. On April 28, 2014, SMP Bank and Sobinbank, which belong to the Rotenberg brothers, were hit by similar sanctions. The Russian parliament is considering a so-called Rotenberg law, a bill that would compensate Russian companies and individuals for assets frozen in the West. However, oligarch Arkady Rotenberg, who’s net worth this year was estimated by Forbes at $1.4 billion, says he had nothing to do with the bill and needs no state subsidies. SMP Bank saw at least $65 million frozen or 2 percent of its 2013 assets at the current rate. The money is placed on hundreds of accounts, the largest of which are in Citibank ($6.55 million), Deutsche Bank, Goldman Sachs and others. The companies and individuals who have fallen under US sanctions are losing millions of dollars. Citibank froze around $10 million on four accounts belonging to weapons maker KBP Instrument Design Bureau. PayPal payment system has frozen the accounts of Donetsk and Lugansk People’s Republics worth $5,354 and $637. The accounts were apparently registered under the militias’ real names. The company declined to comment on the news.